D= fdesign.arbmag constructs an arbitrary magnitude filter specification object D.
D= fdesign.arbmag(SPEC) initializes the Specification property to SPEC. The input argument SPEC must be one of the entries shown in the following table. Specification entries are not case sensitive. Specification entries marked with an asterisk require the DSP System Toolbox™ software. A — Amplitude vector. Values in A define the filter amplitude at frequency points you specify in f, the frequency vector. If you use A, you must use F as well. Amplitude values must be real. For complex values designs, use fdesign.arbmagnphase. C — Constrained band flag. This enables you to constrain the passband ripple in your multiband design. You cannot constrain the passband ripple in all bands simultaneously. F — Frequency vector. Frequency values in specified in F indicate locations where you provide specific filter response amplitudes. When you provide F, you must also provide A.
N — Filter order for FIR filters and the numerator and denominator orders for IIR filters. F and A are the input arguments you use to define the filter response desired. Each frequency value you specify in F must have a corresponding response value in A. The following table shows how F and A are related. Different specifications can have different design methods available. Use designmethods to get a list of design methods available for a given specification and filter specification object. Use designopts to get a list of design options available for a filter specification object and a given design method. Enter help(D,METHOD) to get detailed help on the available design options for a given design method. D = fdesign.arbmag(SPEC,specvalue1,specvalue2,...) initializes the specifications with specvalue1, specvalue2. Use get(D,'Description') for descriptions of the various specifications specvalue1, specvalue2, ... specvalueN. D = fdesign.arbmag(specvalue1,specvalue2,specvalue3) uses the default specification 'N,F,A', setting the filter order, filter frequency vector, and the amplitude vector to the values specvalue1, specvalue2, and specvalue3. D = fdesign.arbmag(...,Fs) specifies the sampling frequency in Hz. All other frequency specifications are also assumed to be in Hz when you specify Fs. Use fdesign.arbmag to design a three-band filter. Define the frequency vector F = [0 0.25 0.3 0.4 0.5 0.6 0.7 0.75 1.0]. Define the response vector A = [1 1 0 0 0 0 0 1 1]. A response with two passbands -- one roughly between 0 and 0.25 and the second between 0.75 and 1 -- results from the mapping between F and A. 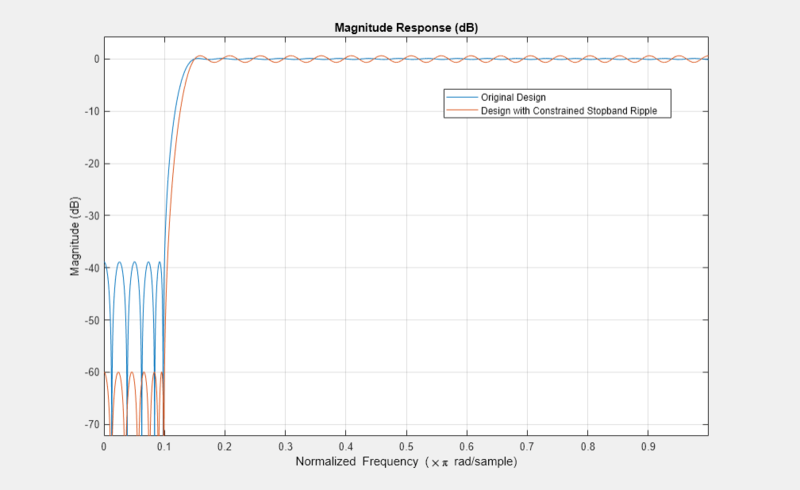 Use fdesign.arbmag to design a single band equiripple filter. 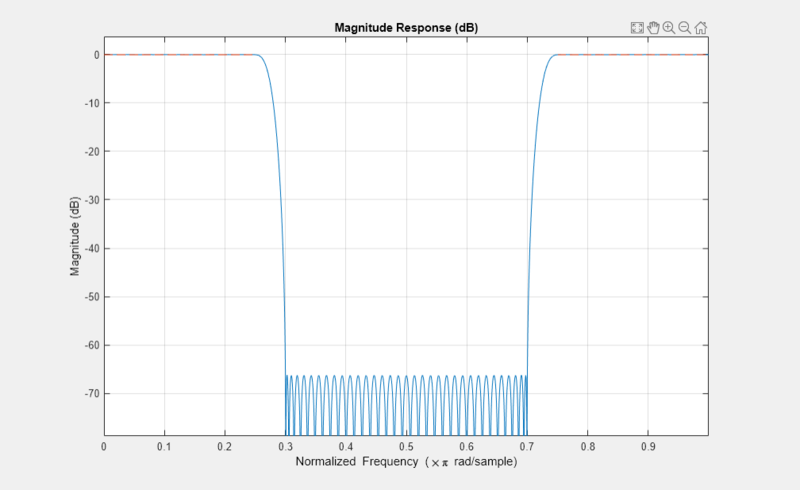 Design a minimum-phase equiripple filter. 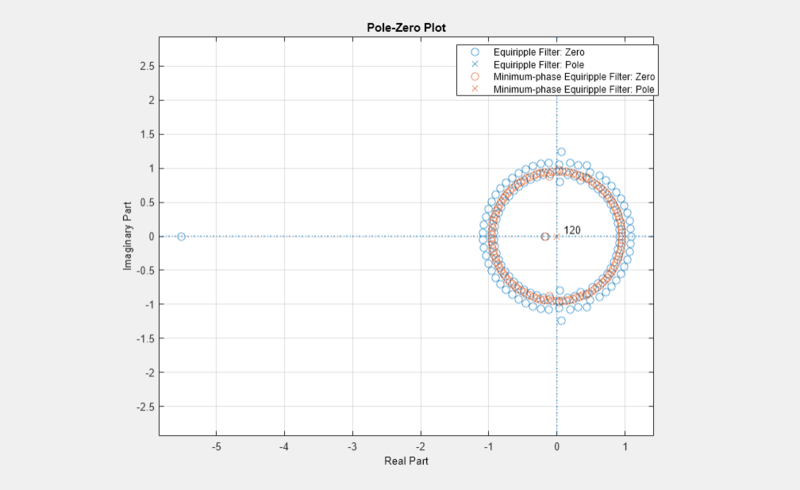 Visualize the poles and zeros of the two filters. Use fdesign.arbmag to design a multiband minimum order filter. Place the notches at 0.25π and 0.55π rad/sample. 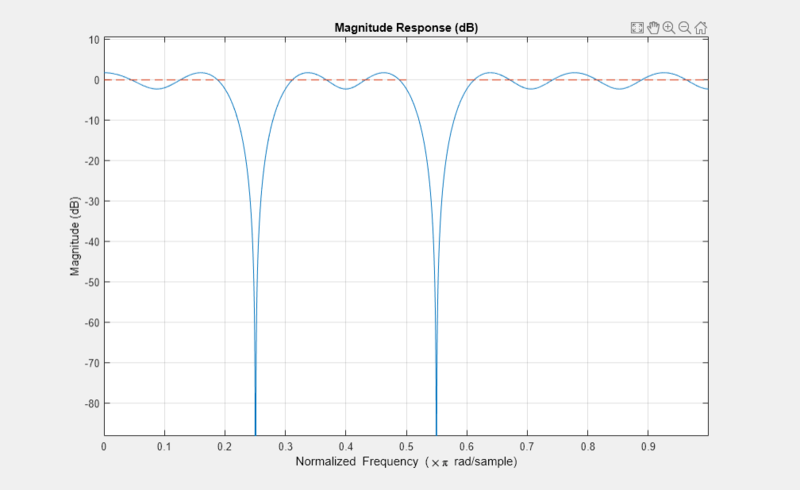 Visualize the frequency response of the resulting filter. Use fdesign.arbmag to design a multiband constrained FIR filter. Force the frequency response at 0.15π rad/sample to 0 dB. Design a filter with no constraints. Add a constraint to the first band to increase attenuation.